Fiire, the company that makes these, has recently dissappeared. Supported by Fiire (LinuxMCE support) / Polywell Computers (hardware). Many users have reported "drifting" issues with the mouse pointer. This issue causes the mouse to move on it's own even when the remote is held still or placed on a table. This has been a long on-going issue with no indication it will be resolved. Wireless R/F gyro remote control specially designed for use with LinuxMCE. Universal I/R support for up to 3 legacy devices. Follow me function (requires additional USB dongles). The Fiire Chief controls both the Fiire Engine and the Fiire Station. It uses RF wireless, and has a range of approx. 50’. It is omni-directional and does not require line of site like an infrared remote. The FiireChief has all the traditional, legacy remote control buttons, as well as 3 specialized ‘gyro’ buttons in the middle that let you control every function using only those 3 buttons and gestural movements. It also has a built-in ‘follow-me’ feature. You can start media in one room, and when you want to move to another room, just take the remote with you and press ‘Follow-me’. Fiire is able to track each remote individually, so whatever media you started with that remote will follow that remote around the house. Your movies, TV and music effortlessly follow you as you move from room to room. And whenever you enter a room, the FiireChief instantly and automatically switches to control the devices in that room. So when you’re in the living room, the volume button controls the volume on the tv in the living room. Take the remote into the bedroom, and the volume button controls whatever tv is in the bedroom, whether or not it is the same brand as the one in the living room. The FiireChief is the only remote control you will need for every room in the home, and you don’t need to worry about which remote goes with which room since any remote can work in any room. 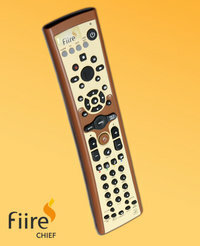 Additionally, the FiireChief has a universal i/r remote built-in with both pre-stored codes and learning. You can program up to 3 i/r devices to control with the ‘tv’, ‘aux’, and ‘cab/sat’ buttons at the top. In those modes, it acts like a normal, universal i/r remote. The FiireChief includes one USB dongle which you connect to a Fiire Engine, Fiire Station, or other LinuxMCE PC running UI2. The device will register as a standard USB keyboard and mouse in recent linux kernels (tested in 2.6.25). However, there are still some buttons on the remote that will _not_ be registered by these drivers. To simplify detecting these buttons there is a ruby gem (install via `gem install gyruby`) called gyruby. NOTE: Fiire, the original company who offered these remotes, do not exist anymore. Fiire website. The LED flashes when you press buttons or the gyro is detecting motion - it is very sensitive, so even the vibrations from music can cause it to continue lit even if you aren't touching it! This page was last modified on 28 September 2015, at 00:01.